I watched the rebuilding of the Episcopal Girl and Boys School. Nearly all the girders, bricks, and building material went up Rockside from Dinham Road. The girders, some of which were very large, were needed to span the two halls in four places each. These were unloaded at the top of Dinham Road placed on wooden rollers and pulled up Rockside by two shire horses as far as the boys school yard. Rockside was a narrow lane, scarcely more than 8 feet wide through out its length, which stretched from Dinham Road, to Bonhay Road. A large part of the school yard wall had been removed to get the girders in where they were needed. There was an extended Summer Holiday in 1938 to enable the bulk of the work to be done. At that time the Rev. Harold Treneer was the head master – he was a very gracious man, a real Mr Chips, every one loved him. I only had Mr Treneer as my head master for one year before he retired. When he retired there was a gathering of all the local dignities and Mr Treneers daughter (who was married to a clergyman) was asked to read from a passage in The Book of Revelation – she was unable to find Revelations and she had to asked her husband to find the reading. Treneer was followed by a dreadful man – A.F.D. Badcoe. He was married with a daughter and lived in the School House in Mount Dinham. It was said at the time that he only got the job because his father had a senior position in the Education Ministry. He was most unsuitable, the boys hated him, as well as the staff. The Head Mistress of the Girls School was Miss G.A.Gillatt she lived in the Headmistress' School house attached to The Girls' School in Mount Dinham. The teachers I remember at Episcopal boys school were. 1, Mr James, deputy head, the boys called him Jumbo because he was overweight. 2, Mr Dingle, assistant head. 4. Mr Hopkins, Music & Science – I learnt a lot from him. 5, Mr Pike, taught art. He wore some heavy rings and he would rap you around your temples with them when he was displeased with you. Then there was Alfie Webster, the Caretaker, who was the headmasters pet, and spy – he would report you for breaking school rules. As a result he got a hard time from the boys. Alfie Webster also had a newsagent and tobacconist on the corner of Dinham Road. At the end of each day we had to put our chairs on the desks so that he could sweep the classroom. We put all the chairs just on the edge and one touch of his broom and they would all fall down like dominoes. The school had a large coke boiler, and when there was a delivery of coke, Alfie went down to the boiler room to shovel the coke away from the bottom of the chute as it came down. The boys blocked the entrance with a blank and only pulled it away when there was a huge pile. There was a rush of coke it buried Alfie, he came up the steps gasping for breath and black as coal – he was met by the boys Jeers, one up to us! Episcopal School was very much a Church School (Anglican) and although it was attached to St. Michael's & all Angels and being a high church, there no working relationship. The school's link was with St. Davids Church, in which we some times went as a school, such as Ascension Day – after Singing "Hail The Day That See's Him Rise Alleluia" we had the rest of the day off. When you started at the School, you were put in one of four houses, named after former Bishops of Exeter. 4 Frederick Temple 1869-1885 later Archbishop of Canterbury. The house you represented remained with you all the time you were at the school. Each house had its own colours. You received marks for a good report and debit marks for bad behaviour. These marks were added or deducted from your house, each class were told each week who was the winning house. A shield was presented at the end of term to the winning house. The morning assembly was often like a church service and lasted for about an hour. We said the Lords Prayer, and often the Apostle's Creed, on Fridays the Catholic Creed, and sang one or two hymns. We sang the church's calender, taken from hymns ancient and modern. Most days there was a bible reading and a short homily. About every couple of months the Bishop was present. All the hymns were rehearsed – I have never forgotten them, and an appreciation of poetry which remains with me to this day. Owning to the war there were many times for special prayers. I particularly remember the school praying for the Channel Islands when they were starving at the end of the war. In Mr Treneers time, the school ran like a well oiled machine the atmosphere changed when he left. The Christian emphasis of our morning assembly was slowly phased out, by Mr Badcoe and replaced with a secular presentation. It spoke so much about the man. Two of my six brothers, Harold, and Charles were head boys, before me, I did not follow there example. Brother Marcus followed after me. When Mr Badcoe introduce himself to the boys, and his staff, he stood on the platform and told us he was selected from 135 applicants, and he was the one chosen, so he was the very best! (God help us!). He went on to say that we could approach him at any time and that he was always available. But if you did, he would bite your head of; it was like disturbing a vicious reptile. He went on to say that he was keen on discipline, for without discipline there would be chaos. "And boys we don't want that do we? I don't hear you. do we? do we? come on we are in this together Do We?" so we all said we did, and that was the way it went – we were bullied into agreeing to his methods with out any discussion. He went on to list a set of rules, 'parameters' he called them, and we the boys not him, were to set the punishments if any rules were broken. He then listed what the punishments would be and we had to agree to them immediately. Having got the nod from us he said "Now you have set the Rules and the Punishments, they were nothing to do with him, the boys had decided how to run the school!" The punishments consisted of a series of corporal punishments, which he would he would administer as and when necessary, by a school thrashing. These took place about every two weeks, at the end of assembly, when the boy in questions was called out of his file and told to come up on the stage. His infringement was mentioned, and the punishment read out. On a table there were laid out six canes of different thickness the boy was told to pick one, and hand it to the Head Master. The Head Master would then slash the air with it and say "so you think this won't hurt. I'll show you." He would then start to hit the boy with it, and then order one of the teachers to hold the boy down while he thrashed him. The punishment was usually six strokes of the cane, but he just went on hitting him, often until the boy ran off the stage with the head master shouting abuse at him for being a coward! I well remember when I had a school thrashing (we all did eventually). He lost his temper as he was caning me and carried on hitting me, I ran off the stage, out of the hall back to my class, with Badcoe, slashing at me as I ran back down the corridor. I sat at my desk protecting my head with my hand as he hit me as hard as he could with the cane, even on the side of my face, we were alone in the classroom while he shouted abuse at me. Before Badcoe came it was rare for any one to get the cane. Badcoe ruled by fear, if Hitler had come to Britain, Badcoe would have been promoted. In my opinion he was a Sadist. If Badcoe did today what he did then, he would be locked up. In about October 1945 a large consignment of oranges arrived in Exeter the first that we had seen since the war started. All the boys were eating oranges and throwing the peel down in the playground, as well as that it was conker time and conkers were added to the mess. It really was a disgrace, and Badcoe went mad, screamed at us and shouted all sorts of abuse at us from the platform. He said no lessons will take place until the playground was cleaned up. So for the next hour the playground was cleaned up and two dust bins were filled. He then came out with the staff, and shouted further abuse, saying what dirty homes had we come from. Some people did not know how to look after a dog, never mind you disgusting lot. This was said in front of his staff. The boys exploded, tipped the dustbins over and belted Badcoe and his stall with the contents and advanced threateningly towards Badcoe and the teachers. A number of the boys ran to the door of the playground and ran out. Two teachers held the door closed, but the boys pulled them aside and left. Afterwards there were only about a dozen boys left, It was mid morning and we had no lessons that day and none until the following afternoon. The register was not called for two days, and we did not see Badcoe for two weeks. I went to look up the Episcopal School records at the Westcountry Archive (means Devon Record Office) s only to find the Episcopal School records are Sealed until 2025. ! About 1943, Exeter Technical School, which was situated in Bartholomew Street, was taken over by the army and large sheds were built in its grounds. The Technical School was moved to the Blind School on St David's Hill. An entrance to classrooms was made by removing a wall next to St David's Institute in Haldon Road. 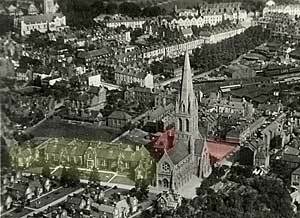 In 1946 I started at Exeter Technical School in Bartholomew Street. Not all the building was available, so the classrooms were split between two old board schools, one in Exeter Street, and the other in Exe Island. Later the school was moved to some army sheds put up during the war in Belmont Park. Before moving again to a new school out on the bypass. Episcopal School, yellow and St David's School and playground, red.